In keeping with a few others that have popped up around my shop recently, I find myself with this oddity. This one is unusually thin, the height of the entire assembled watch is only 7.2 mm including the crystal. I would estimate the thickness of the case without crystal at 5.5 mm. The outer bezel is concave, which I don't think I have seen before on a Bulova. 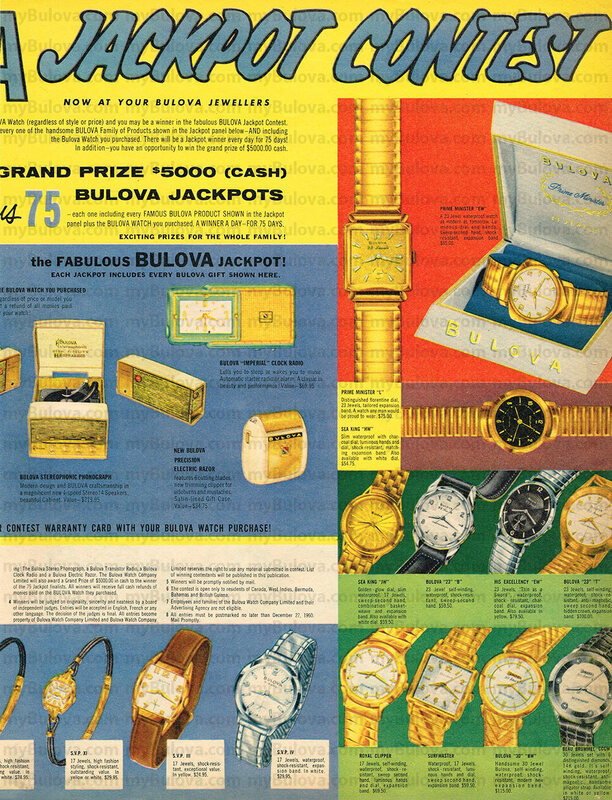 US patent 2871654 refers to a waterproof case design by Emil Fachon, working for Bulova at the time. Filed April 14, 1954 and published Feb 3, 1959. It follows the design of the Watertites in that the case back is deep and pressure fits to the bezel and uses an armée crystal as well as pressure form the bezel to seal the case. The case is 34 mm which is a decent size for the period, and I think it will polish up well and be a good candidate for full restoration. This watch looks to be a match to the Surf Master (as seen in this 1962 ad). The earliest ad for this model that I can find is 1961, and also that year for mention in the pricelists. There is another model prior to this time that used this case, from the SVP series, but I do not see any ad showing the black dial option. This 1960 SVP ad shows this case with same dial, only in white. I'm not sure which to call this one, SVP or Surf Master. With a white dial I would go with SVP. Actually this looks like a match for the Surf King, item 'A' on the same 1962 ad. The black dial version has the same layout exactly. I must say the 'SVP' name does a disservice to the product, it seems unimaginative and encompasses watches of dramatically different styles. You're right. I mean't to refer to the Surf King in that ad, item A...not Surfmaster. Yes, SVP is an odd name for these various models. Since there are only a handful of advertisements, it must have been a short-lived model name. There is one SVP model that started its life as the Ruxton, and also other names besides SVP; perhaps a way to re-market an old design. The watch seems to be a match to the Surf King in the '62 advert but I'm not sure I like going with a 1962 ad to name a 1959 watch, especially noting the price list doesn't have it until 1961. I'm tentative to the Surf King. I will add to the price list mention, that this Surf King model is listed in the 'NEW' section for 1961. The next older pricelist we have goes back to 1958, so we have a couple missing years. I agree that 1959 would be a stretch given this information. My gut tells me it would have been a different model name two years prior, and it was being called the SVP with a white dial according to the limited ads we have for this model line. 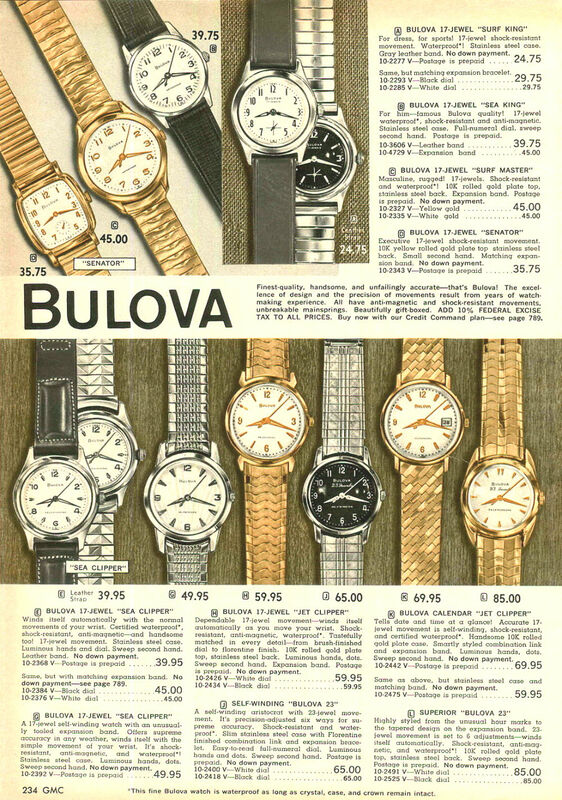 The pricelists show that there were six men's SVP models; I can identify four different men's models in the ads, so there is a possibility that a black dial option is one of those six. It would make sense to call a watch like this something like Surf King, mainly because of the trouble gone to make it water resistant.